Imagine designing self-healing physical environments that work in concert with self-healing IT environments. This is the power of OpenDCRE. The basic principle is this simple: If you take the heat exhausts from a cluster of servers and point them toward a central cylinder, like a covey of quail, then run a chimney pipe from that axis, you create a convection. As hot air rises, cooler air rushes in to replace it. This principle is the central tenet of Vapor IO’s not-all-that-radical data center cooling architecture, which it claims could drive PUE ratios down by close to 10 percent, from an average of about 1.7 to 1.6. For this principle to be enacted in the world’s data centers today, both old and new, most everything about their architecture, layout, and construction has to be reconsidered. On Wednesday, Vapor IO took a critical step toward making such a reconsideration actually happen on a grander scale, with the official announcement of its having joined the Open Data Center Alliance. The original purpose of the ODCA, as we reported in 2011, was to concentrate the buying power of multiple organizations, toward infrastructure components that best suit a broader range of customers. Commoditization is one very effective approach to making these components both more affordable and less proprietary, as has been proven by Facebook’s efforts with the Open Compute Project. Cole Crawford was the founding executive director of that project’s foundation. At an industry conference last September, Crawford demonstrated a simulation of the airflow of two data centers, one employing his company’s vapor chambers, and the other using the standard hot aisle/cold aisle layout. In explaining its physics (in a manner Richard Feynman would have appreciated), Crawford asked attendees to imagine having to evacuate the water out of a bottle by blowing into a straw. “I don’t care how strong your lungs are,” he said, “it wouldn’t happen. “In thermodynamics, air moves exactly the same way as water,” he continued. The formal name for this motion is the Venturi effect — the principle that, when a fluid or gas moves through a constricted pipe, its velocity rises and its static pressure proportionately declines. More fluid or gas rushes in from behind to fill the vacuum. In Vapor IO’s design, heated air is helped along upward by way of a fan. Now, if layout were the only element of vapor chamber design, you might think that it wouldn’t be that big of a deal to release it to open source. But there’s another critical element that makes the company’s enrollment in ODCA make a lot more sense: the monitoring and automation interface. 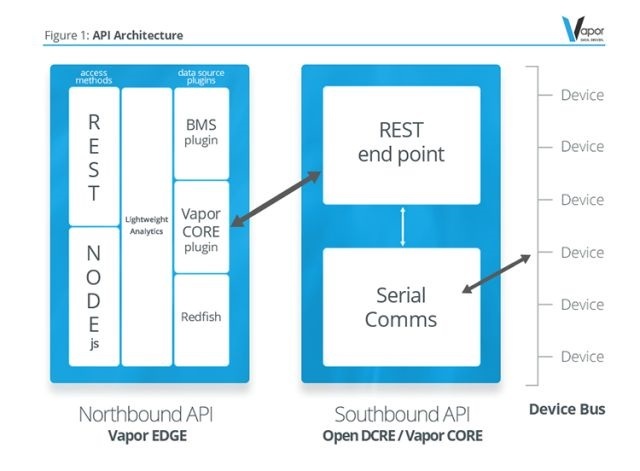 Last month, Vapor IO released version 1.2 of its Open Data Center Runtime Environment (OpenDCRE). Borrowing a phrase from the realm of SDN, the company describes OpenDCRE as including a “southbound interface.” This is comprised of a RESTful API which gives resource monitoring and workload orchestration tools real-time access to the current statistics for every device in the rack. As Crawford confirmed for us, Vapor IO racks would follow the Open Rack standard. One of those orchestrators to which OpenDCRE will be connected is Mesosphere’s DCOS — the groundbreaking, container-based, multi-server workload orchestration platform which has attracted the earnest attention of the communications industry. Trifiro pointed us toward an “unprecedented” future where very granular workloads — conceivably, individual microservices — could be orchestrated and scheduled for deployment on specific servers based, in part, upon their up-to-the-minute physical conditions. “Data centers today not only have a gargantuan amount of data to collect,” said Vapor IO’s Crawford, “but that data is, at best, delivered near-time and through proprietary interfaces. Additionally, data center operators and staff have to ensure uptime, but when the pager goes off at 2 in the morning, it’s fair to say we’re likely not operating at 100 percent. The role of the sysadmin has matured into a more proactive DevOps role. OpenDCRE makes this maturation possible for data center operators as well.